Skip the drive-thru and make these super tasty ground beef tacos! This recipe is a great one to have for easy weeknight meals. All of the recipes on Healthier Dishes are pretty easy, but this Beef and Black Bean Taco recipe might just be the easiest ever. It has certainly become one of my favorites because of that. Well that, and of course because they are just plain delicious! I like to top my tacos with a little pico de gallo, Monterrey Jack cheese and lettuce. You can certainly use whatever toppings you prefer. For this recipe, I took a little help from the store and purchased a container of pico de gallo. I also bought a bag of Taylor’s Organic shredded lettuce to make things even easier. If you’re looking to make a delicious topping of your own, this Fresh Mexican Salsa recipe is super yummy, and yes, much better than the store-bought stuff! If you prefer just plain diced tomatoes on yours, then use that. Hate tomatoes? Don’t use them! That’s the beauty of this dish. You can tailor it to suit your own tastes. 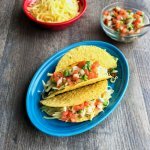 My husband and I both loved these tacos, and he wasn’t even a huge fan of tacos before I made these. These aren’t the dripping-with-grease kind of tacos that you might find at a Tex-Mex restaurant. They are, however, full of flavor and get a dose of fiber from the added black beans. Plus, the beans help to stretch the pound of beef. When you’re using pricey grass-fed beef, that’s always a bonus! 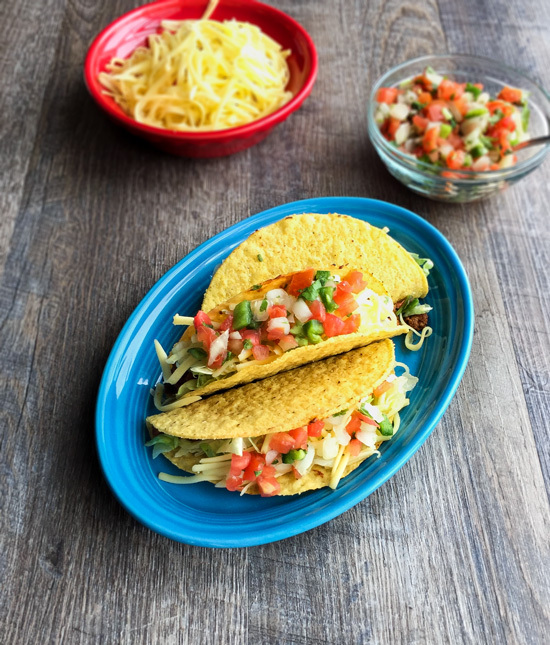 If you are looking for a great side dish to serve alongside these tacos, my Easy Mexican Rice is a great option. You just need to get that started before cooking the beef. Even with the rice, this can still be done in about 30-35 minutes! Not bad for a super delicious and fun weeknight meal! By the way, if your family is into doing non-traditional holiday type food for Christmas like mine, these Beef and Black Bean Tacos would be a perfect option. You could double the recipe (depending on size of your family) and set up a taco bar. Put out all the toppings, and your friends and family could build their own tacos. Speaking of toppings, my Pickled Jalapeños and Carrots are another tasty option! *I get my taco shells at Trader Joe’s. They are organic and the ingredient list is pretty good. Plus, the price is great! 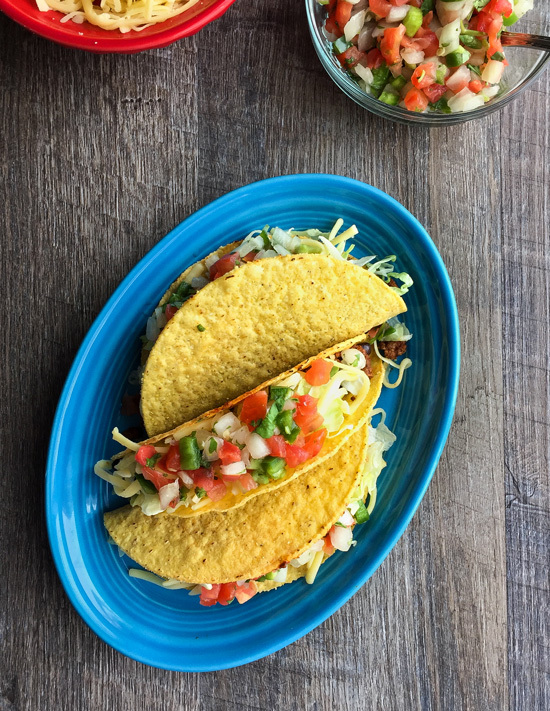 Make your own Beef and Black Bean Tacos at home with this quick and easy recipe that can be done in under thirty minutes! Begin pre-heating the oven according to your taco shell box directions. Heat the oil in a 10.5-inch skillet, add the ground beef and let cook, breaking it up with the back of spoon as it browns. Once the beef has cooked through, stir in the drained black beans and seasonings, and let cook for another 3 minutes, stirring occasionally. Meanwhile place taco shells onto un-greased baking sheet and place into oven to warm according to package instructions. Start building your tacos with the meat mixture and choice of toppings, then serve. If not using lean ground beef, you will need to drain the beef after cooking, before adding the beans and seasonings. By Tempie at September 3, 2017 .